I am a new customer and I just got my number port done. I am trying to disconnect my landline from Century link. When I open the phone panel outside my home I did not see any red/green line that I was expect. I saw the picture shown below. I think I have to disconnect blue/white line on the right side of the picture. Let me know if this is correct and if there is anything else I need to do. DISCLAIMER I am no expert! However, judging from the picture it simply looks like the NID has some extra safety mechanisms built in to where the trunk line? 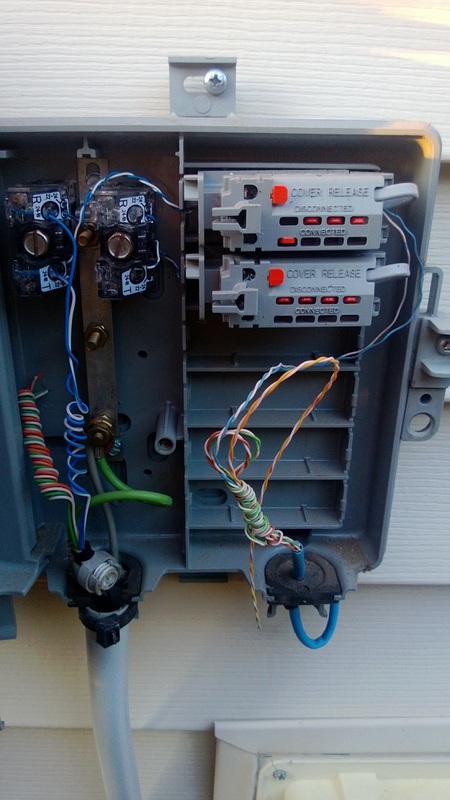 (if that's the right term) interfaces with your home's wiring. If I were to guess, I'd say the red tab would allow you to remove part of the plastic shielding and merely disconnect the test line from the test jack behind it, thereby breaking the circuit and disconnecting Century Link. I removed blue and white lines, wrapped them with tape, left a note saying do not connect land line. After that I plugged in telo into a phone jack. All phone jacks are now working as expected. hehateme wrote: I removed blue and white lines, wrapped them with tape, left a note saying do not connect land line. You did the right thing, just make sure you wrapped the Blue and White separately so they won't short. They are using Cat5 Data wiring for Phone, not uncommon.